Trade wars are heating up but China could use its currency to fight back, if it wants to up the ante. One strategist warns that markets have become complacent and expect China to hold its currency in a range, but it could go back to letting it drift lower as it did earlier in the summer. China has already warned it would retaliate against new U.S. tariffs with its own tariffs, but it could also decide to use its currency as a weapon, allowing it to weaken against the dollar. Earlier this summer, President Donald Trump had criticized China for intentionally keeping its currency weak. 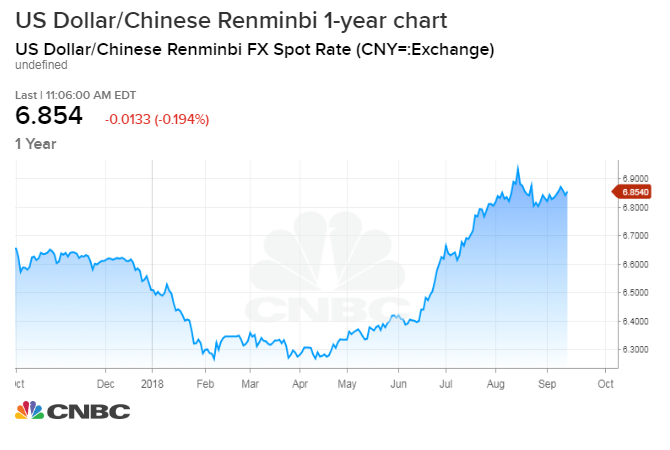 At the time, strategists said it appeared China was not intentionally allowing the yuan to fall, but it was also not stepping in to curb its decline as it previously might have done. But for over a month now, the currency has been steadier, holding in a range. "If they let the currency move beyond 7 in the face of these tariffs that are going to be announced today, then the dollar will move globally. When the Chinese currency is really on the move, it drags down a lot of the other currencies with it, and the dollar goes higher" said Jens Nordvig, CEO of Exante Data. "I think the next couple of days are crucial." China's central bank sets a daily exchange rate for the yuan based on recent prices, and allows trading against the dollar in a band that could be as much as 2 percent above or below that level. The U.S. announced 10 percent tariffs on $200 billion in Chinese goods Monday evening, and those tariffs are expected to rise to 25 percent by the end of the year. Strategists have said they expect little progress on the trade front until after the midterm elections in November. "If they have a different target and fix the currency differently, it's really, really important," said Nordvig. If the currency were to go to 7 yuan to the dollar, that is seen as a key line that could trigger a steeper fall. Dollar/yuan was at 6.85 on Monday. Nordvig said there's a 50-50 chance China could let its currency fall again. "Everybody is too relaxed that they've repegged the currency again. It's never going to move," said Nordvig, warning if there could be a snap higher in the dollar. "Why would they help out Trump on the currency front. It doesn't make any sense to me," he said. The dollar was lower Monday, even though it is often higher on days when trade news is in the headlines. Mark McCormick, head of North America foreign exchange strategy at TD Securities, said the dollar could have moved lower because of news reports that the administration was going to announce tariffs of just 10 percent on $200 billion in goods, instead of the 25 percent originally threatened. "I think the markets are getting a little more comfortable with the notion you're going to see tariffs leveled on China," he said. Nordvig said the next level to watch on dollar/yuan is 6.90. "They've done so many things to avoid it going up above 6.90," he said. If China lets the currency fall to 6.90, "everything is going to move a lot ... I would say the next two days are crucial."